Today I pulled out my favorite sock and smiled at this whole box of fun socks I haven’t worn in forever. But now I get to! 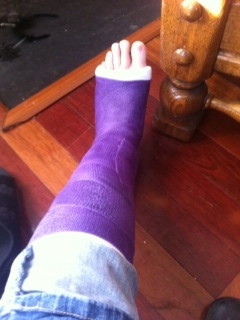 Other than the socks I’m hard-pressed to think of a benefit to this silly broken foot. I broke my left not my right foot so I can drive – although my oldest daughter just got her learners permit so I don’t really get to drive anymore…ever. I didn’t break my hand so I can still work and do school. I don’t have to have surgery. I have great kids who help when I need it…granted I do need to holler most of the time, but I’m good at that! And a Mama who shows up when I need her…THAT is sacrificial love to come to this nutty place! And now, I’ve had the blessing of sweet friends who have been making me dinners for a week! And friends who have helped with my house. And friends who have picked up and delivered my children different places. And friends who call and check on me. I truly am blessed. When I was young, my Mom and I sang a duet at church – Count Your Blessings. Recently someone sent me those lyrics too! I love that song. I think it’s a beautiful thing – because we absolutely see God’s love, provisions, and protection when we start paying attention. In some ways it is more a count the cost thing… not a count the blessings. But the cool thing is that in counting the cost Paul recognizes that the cost is nothing compared to Christ – the ultimate Blessing. Oh I love that! I wish I lived like that! I wish I was more like Paul… more like Paul in things like this, not the thorn in the side (got that), not in the doing what I don’t want to do (yup got that) and not doing what I want to do (got that too). I want the “to live is Christ, to die is gain” thing. I want to live like a truly know, believe, get, want, have the understanding that everything fades in comparison to Christ. I’m getting there. Gosh, I think sometimes I’m 10 steps back 8 steps forward 14 steps back 9 steps forward. I think the good thing is that I’m still moving forward – I believe that is wholly a God thing. God pursues me and loves me back again and again and again…and each time I’m even more grateful, even more in awe of Him. There are things that I can count as blessings and there are things I can count as costs of following Christ. Some blessings are surprisingly good and some costs are significantly painful, but I know that Christ is worth it all. He always has been and always will be. Next Article What does God have for us? Your writing is inspirational and has helped me in my walk with Christ. I heard you speak on Focus on the Family in Cape Town and came across your blog when I googled you as I was very touched and blest by your testimony.I’m not a single parent but I feel that the focus on Christ and fixing our eyes on Him even when things aren’t going the way we want is encouraging. My faith is constantly challenged as I read about your depenance on God. I particularly liked your needles and grapes blog as it spoke to a situation I was going through. Thank you for reminding us as Christians to trust and love God even when times are hard and to simply trust Him and draw closer to Him. My thoughts and prayers are constantly with you.